It's been a minute since we have done an official introduction and backstory on how Gingersnap Studios was born, so we figured now is as good a time as any! So hey! We are Natalie and Amanda! 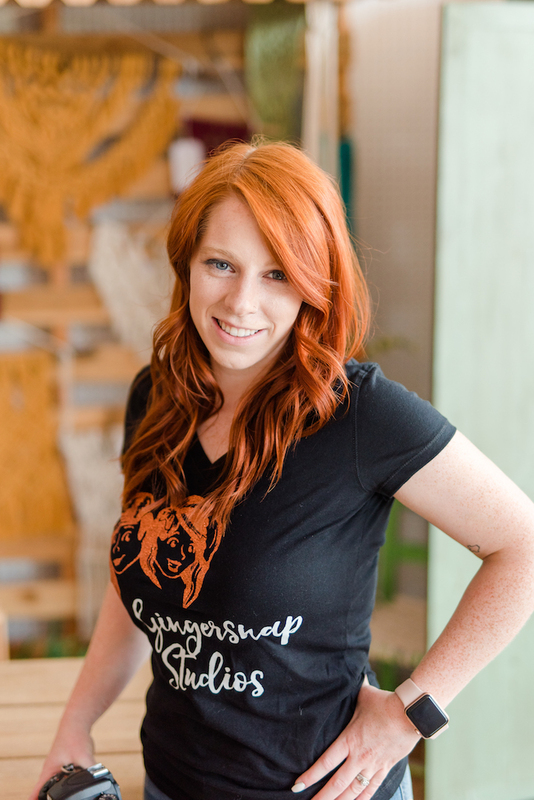 We are two red headed photographers who ran separate businesses and merged them to create Gingersnap Studios. We are mostly known for our fire red hair, and mild (major) obsession with cactus (Natalie) and llamas (Amanda)! We have a big dream fueled by a burning passion for capturing love in an authentic and joyful way! We laugh with our clients A LOT at sessions and weddings, which creates a naturally joy-filled experience. We leave every session with happy hearts and feeling so inspired! Read about us individually below! I have always loved being creative, making art, and taking pictures. Even as a kid, I would line my stuffed animals up and do “photoshoots” with them. I also always dreamed of owning my own business. I actually wanted to own a pet shop/rescue and I still think that one will come true one day. In the mean time I have four crazy fun puppers and that's close enough for me! Ultimately I always knew I wanted to work for myself! During my senior year I started doing sessions for friends and family. To my surprise, more and more people began hiring me to do sessions and even weddings! I continued photography during college until my husband, Andy, and I got married and took over an Antique Mall in Downtown Denison. I thought I could do it all! Run an antique mall, work part time for my parents, AND do photography. Something had to give. I, being honestly super burned out, chose to focus on the shop. We did that for 3 years and then my lovely husband (of 7 years this month!) decided it was time to pursue his passion, Information Technology! We rented the store out and I was still pretty darn burned out. I took a few sessions here and there but it wasn’t until about a year later that I decided to do some fall mini sessions. I actually really enjoyed and decided it was time to start up the photography business again, but the right way! Married to my sweetheart Erik, momma to two boys, and two boy fur babies. To say I'm outnumbered in my house is an understatement! I, like Natalie, have always been super creative. As a kid I loved to draw, write, do crafts, etc. My senior year of high school I joined yearbook and really found a love for photography. After I graduated, I started photographing friends here and there, but then got busy with life and put it on the back burner. In 2014 I had my first son Eli and dusted my camera off to take photos of him! I quickly remembered my love of photography and no joke...the SAME month that Natalie did her first mini sessions, I did them as well! We had been sort of mirroring each other unintentionally for YEARS and we didn't even know it! We talked a lot over facebook about photography and our separate businesses, then had the bright idea to second shoot for each other for a couple weddings we had booked in 2016. We realized how much we truly loved working together and decided to merge our entire businesses January 1, 2017! So here we are, 1.5 years later and we are moving SO fast and living our dream! I just had my second baby boy 3 months ago and couldn't even IMAGINE running a business without Natalie! We truly work SO well together both during sessions/weddings and behind the scenes. It flows perfectly and we are so insanely blessed!